Hint: Click on the photos to see a beautiful full-screen view. Thanksgiving is perfect day to gather around a table dressed in colorful tablecloths and napkins and groaning with season's bounty to give thanks for one another and for the food that has been prepared. Having been born in Montreal, and now living in Burlington, Vermont, I am happy to celebrate Thanksgiving in both places. Canadian Thanksgiving is October 11, and by the time American Thanksgiving comes around the end of November, I will be ready for the second batch of turkey and trimmings. I enjoy dressing the table with layered tablecloths and toppers, and sometimes use two napkins at each place. It's nice to combine a solid napkin and a print that I either fold together or hold together with a beautiful napkin ring. Canadian Thanksgiving is this weekend, so its time to start thinking about dressing the table. 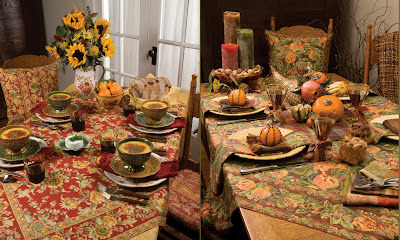 I'm sharing two settings as inspiration for a colorful, warm and wonderful table. Tomorrow, I'll be sharing my recipe for traditional Apple Crumble, so be sure to stop back by! These are beautiful tables. It would be difficult to decide which one to use! It's a good thing you have two Thanksgivings to celebrate. Looking forward to the Apple Crumble recipe.